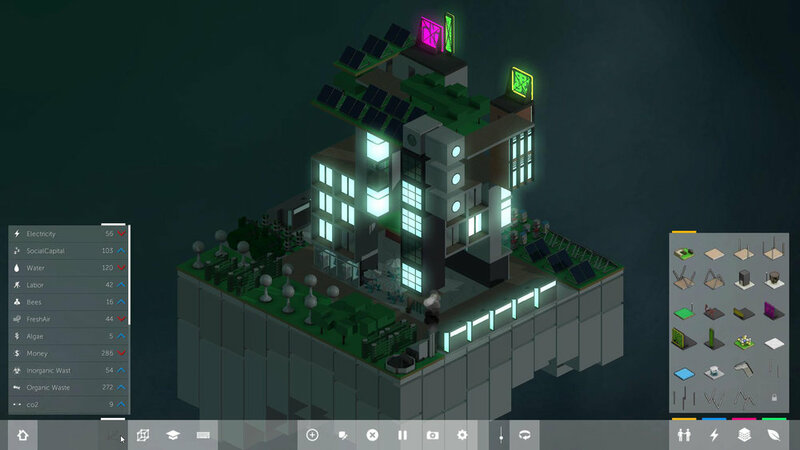 Block’hood is a city building simulator video game that focuses on ideas of ecology, interdependence and decay. The game invites players to envision a neighborhood, by building structures out of a catalog of 200+ blocks. The player is challenged to maintain an ecological balance as each block placed will consume and produce resources of different kinds. Blocks that are not provided of their required input, will slowly decay and deteriorate to a point of collapse. Player creations will attract inhabitants, both humans and animals, that will populate your neighborhood. It is the hands of the player to provide a positive environment for inhabitants to prosper. The game is both an educational and research initiative exploring the connection between games and architecture, contributing to a form of digital infrastructure for the ecological and systems thinking that is necessary in contemporary urbanism. The project won the 'Best Gameplay' Award at Games for Change festival in New York on 2016, was one of the finalist for 'Games for Impact' at the Game Awards in Los Angeles on 2016 and was a finalist as 'Best App' in Fast Company's Innovation by Design, also on 2016.